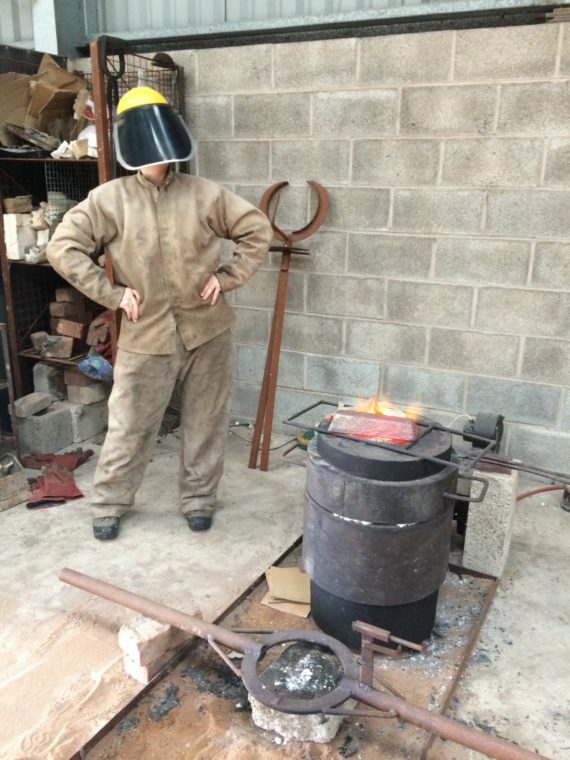 My proposal for the AN Professional Development Bursary is develop experience in Bronze Casting with Scartworks, a small foundry in Ormskirk, Lancashire through shadowing and assisting on their commissions and receiving 1-2-1 tuition in all stages of the casting process. 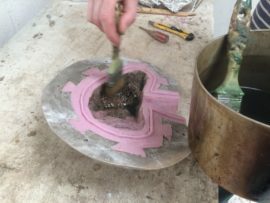 Throughout the bursary I have been working both on taking a piece through all stages of the casting & finishing process and intermittently working on Scartworks other commissions as and where I was needed. I’m not quite sure which part of the process I enjoyed most, the relatively small scale of Scartworks worked so well for the bursary as I have been able to work across the different stages. I have left the bursary feeling inspired to continue working with and developing new work through these processes. 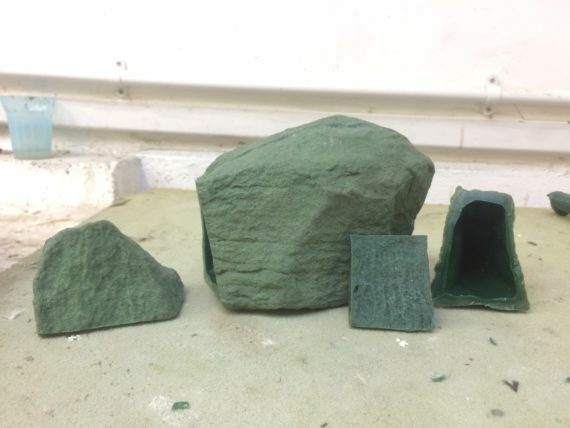 Moving into the New Year I’m looking forward to working with Scartworks again, developing new ideas through the processes I have learned and meeting up with the newly formed Sculpture club! Thanks for your support a-n, it is much appreciated! 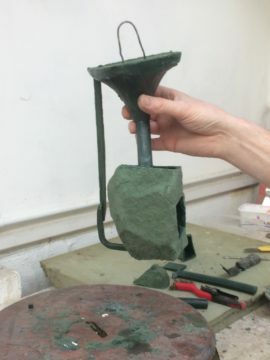 Reassembling – once the bronze was cleaned the next job was to grind off the spru’s and any inwanted bronze left over from the casting stages. 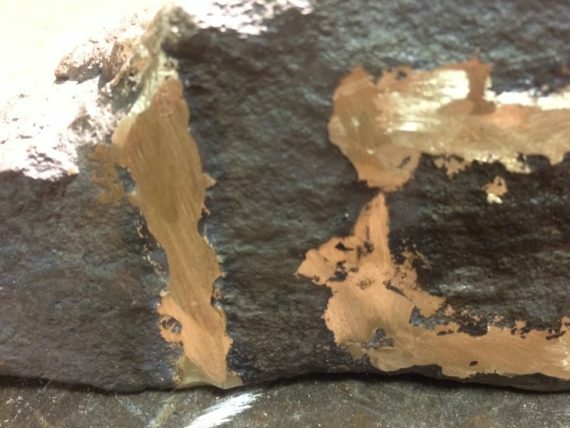 The joinging edges of seperate pieces of the bronze were smoothed and bevelled slightly. 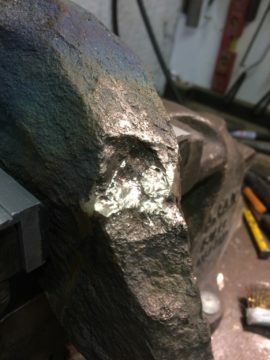 This bevelling would create a channel for the weld to join the sections.I think the last time I did any welding I was 16 so I couldn’t remember what to do, also last time I had done MIG welding and this time we would be using TIG. Stephen patiently taught me how to weld. 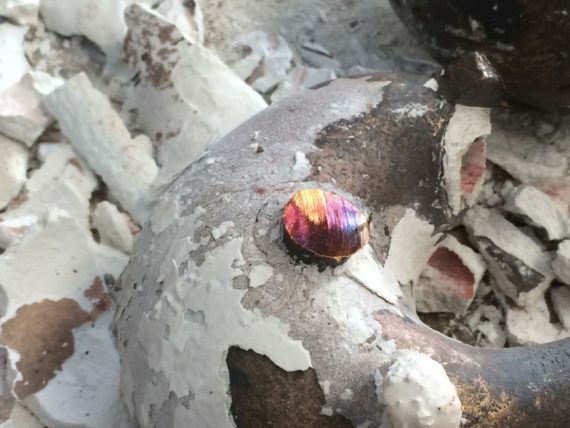 Working at such a small scale, learning to obseve when the metal was at the right moment, tacking on an creating careful seams and joins reminded me of to sewing. 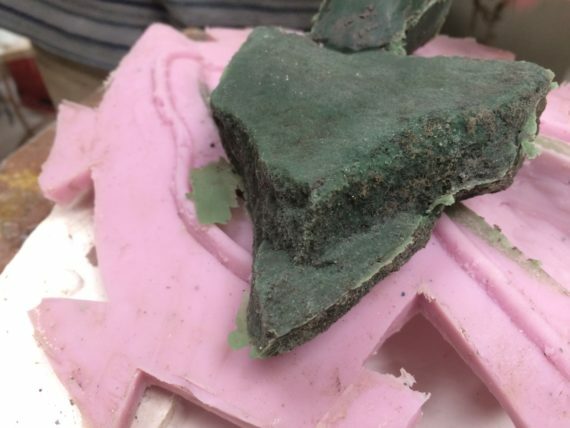 Each stage of investment/lost wax casting requires you to be so present whether its becaue you are working with such high temperatures of the moulten metal, fragility of joining materials with heat or attention and patience needed in creating the moulds. Chasing – Once the welding was completed we had to remove all signs of our work. 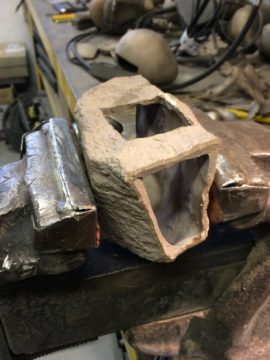 I carefully worked back the protuding weld using various different grinding tools and then, removing any of my hand, working back in the detailing of the rock and preparing the bronze for any patination. 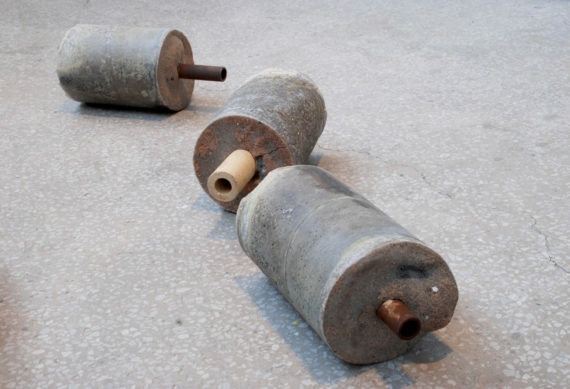 Lost wax – The ceramic shells were tidied up around the neck/opening. 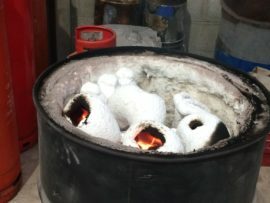 The piece was then placed upside down in kiln that allowed the wax to melt out. 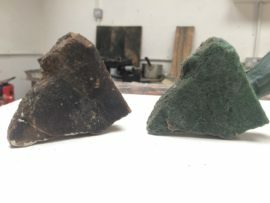 Curing – Once cooled & checked over for any cracks, these are heated up again and cured – preparing them for recieving the molton Bronze. 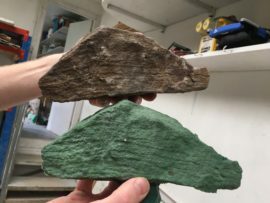 Whilst hot, these are placed upright in the pouring pits, supported by sand (the tin foil ontop stopped any sand from accidentally getting into the mould). 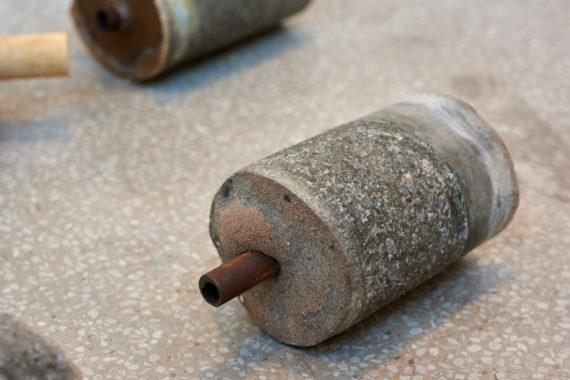 Bronze pour – the bronze ingots are heated to 1900 degrees in the crucible & furnace. 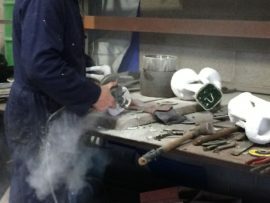 There are various methods depending on the scale of the equipment at foundry and size of the crucible/work being made. 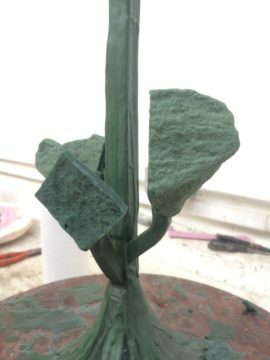 At Scartworks, the pour is done manually by two people so there is a really specific & careful choreography that we took to pour the bronze. 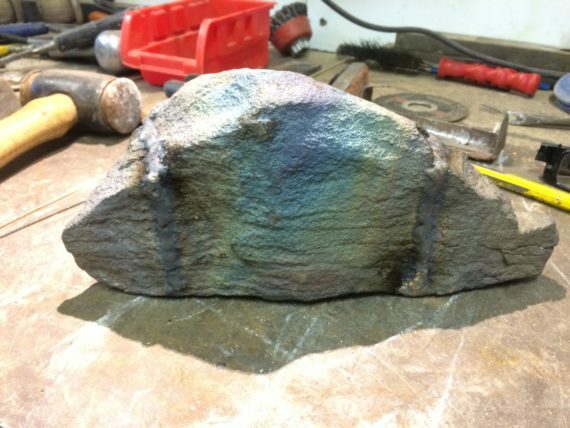 Devesting – Once the bronzes had cool enough they were removed from the pouring pit. 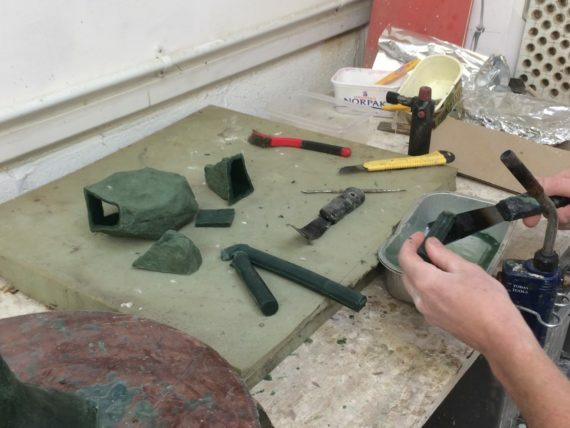 Then followed ‘devesting’ the bronzes by breaking off the ceramic mould. 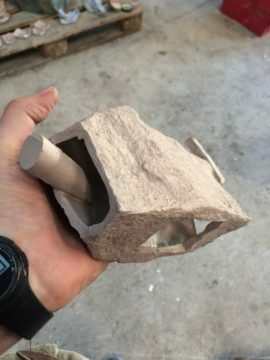 As much as possible was chiselled off at this stage before sand blasting off the remaining pieces. 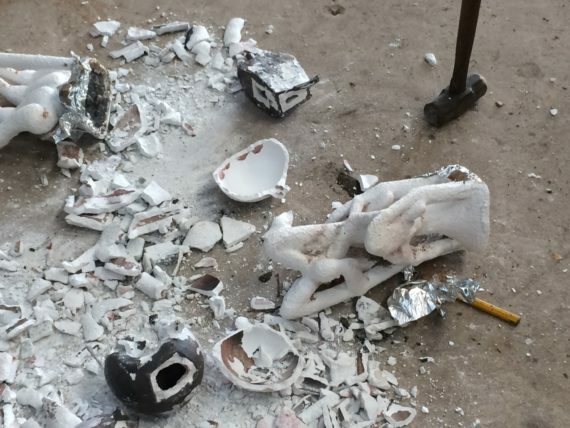 Removing all traces of the ceramic shell was really important before reassembling the bronze. 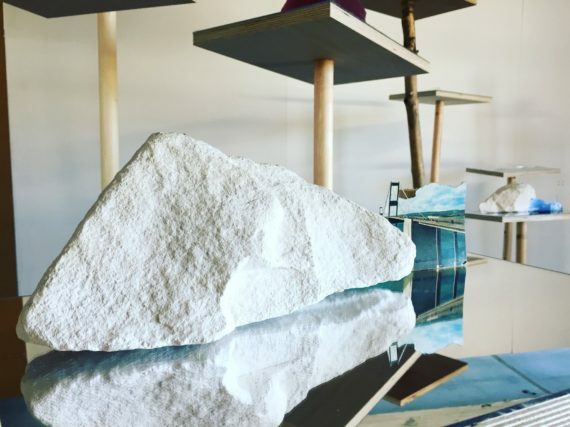 We made a few plaster casts of the rocks which form part of a current work in progress of Hilary Jack’s, titled ‘Shadow of the Future’. I then took a test work though to the rest of the stages towards a bronze. 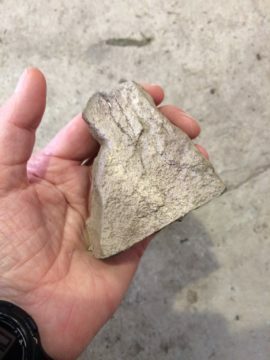 The rocks had left some dedbris in the silicone moulds so we cleaned these by brushing a thin layer of foundary wax and pealing this away again and the bits of rock with it. Next we prepared the moulds to make the wax copies. 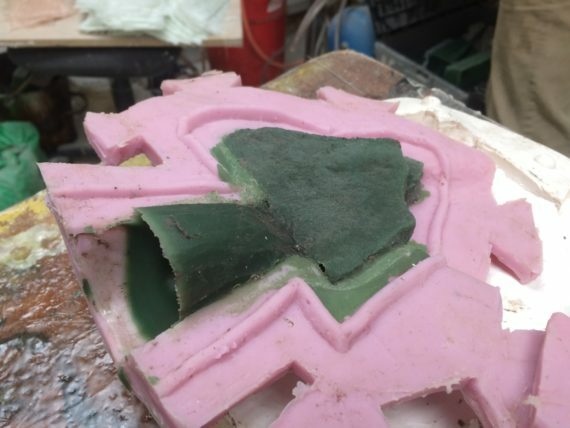 We again brushed a thin layer of wax within the mould to make sure to catch all the surface details before joining the two halves together. 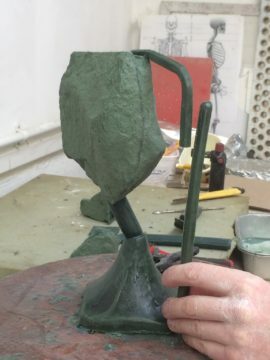 This was followed by pouring in the wax and rotating the mould to make sure everything is covered and an even 3mm depth of surface captured. 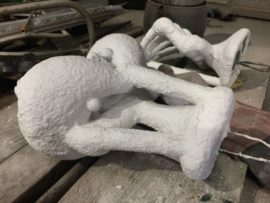 Once cooled, the mother mould and silicone mould are removed. The wax copy is inspected for imperfections like air pockets caused by bubbles. 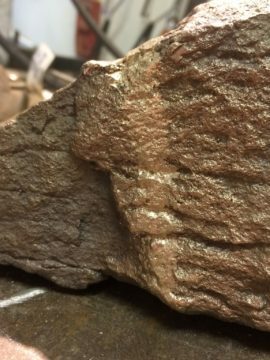 The seam line and any of these are carefully tidied up (chasing) so a perfect wax copy copy of the origial object is achieved. Then this is cut up!! 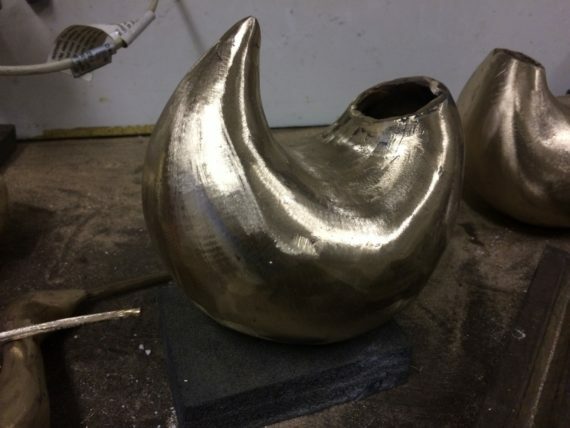 I had no idea quite how many skilled and lengthy stages were involved in making a bronze, so I was a little surprised when I had to carefully splice up my the wax copy I had lovingly laboured over. But next came the spruing & gating which I really enjoyed. 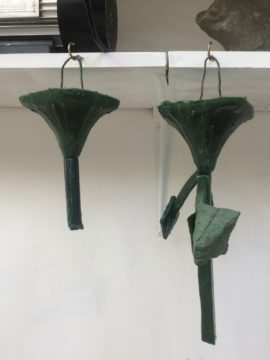 This involed joining (with a hot knife) the different sections of the wax copy to a tree of wax rods and a larger cup where the bronze would be poured. 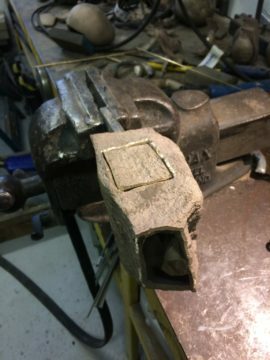 You are always having to think at least one or two stages ahead of yourself – the orientation and placement of each piece on the tree was really important as you had to consider the flow of the bronze and potential air blocks. Once this was all joined we made a secondary mould/ceramic shell around the wax. 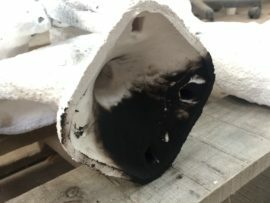 This was done through a process of dipping the wax into a ceramic slurry followed by covering it with different grades of molochite (silica sand). 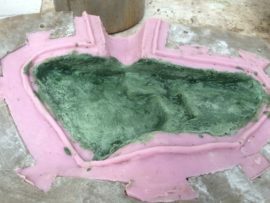 This coats the wax copy inside and out creating a one piece hollow mould. Each layer is dried before another dip and until the desired thickness of ceramic wall is achieved.